All are very welcome to join us for the first of this term’s screening and discussion sessions, which will take place on Monday the 26th of October, 4.30-7pm, in Jarman 7. 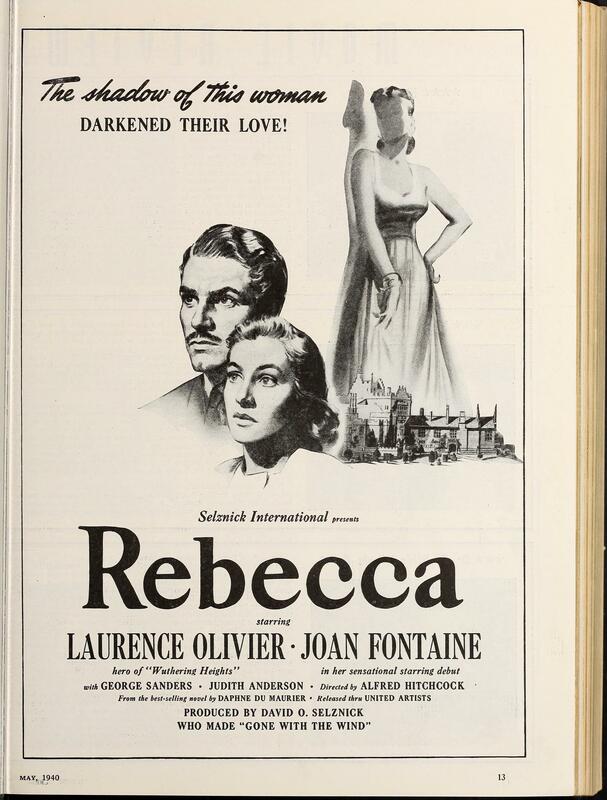 The first of our Gothic season is Rebecca (1940, Alfred Hitchcock, 130 mins). The presence, and positon and size of the illustration of the two stars is instructive. The large head and shoulders portrait is placed centrally. The wide-eyed facial expression of the second Mrs De Winter is in keeping with the ‘woman in peril’ theme of the Gothic we are focusing on this term. Significantly, underneath the credits it is noted that this is the ‘sensational starring debut’ of Joan Fontaine. This chimes with her character’s naïve, unknowing initial state and her eagerness to uncover the truth. Laurence Olivier is more straightforwardly billed as previously being the ‘hero’ of Wuthering Heights. Rebecca is also an adaptation, but of a more recent popular novel by Daphne Du Maurier. The illustration of Olivier is suitably moody given Maxim De Winter’s complex character and contrasts to Fontaine’s concerned expression. The Manderley estate, the subject of Du Maurier’s novel’s famous opening line, ‘Last night I dreamt I went to Manderley again’, is also prominently placed. This is seen just underneath the looming figure of Rebecca, indicating that she continues to ‘haunt’ the house. Do join us if you can – the intersection of stardom, male and female relations, Gothic tropes and domestic space will provide lots of food for thought. Mary Anne Doane’s chapter “Female Spectatorship and the Machines of Projection: Caught and Rebecca.” The Desire to Desire: The Woman’s Film of the 1940s (1987): 155-175. Lisa M. Dresner’s chapter “A Case Study of Rebecca”. The Female Investigator in Literature, Film, and Popular Culture (2006): 154-182. All are welcome to attend the sixth of this term’s screening and discussion sessions which will take place on the 27th of November in Keynes Seminar Room 6, from 4pm to 7pm. We will be screening Tamar’s choice: Coquette (1929, Sam Taylor, 76mins). The article’s treatment of performance, audience expectation (both star and genre) and the way in which these sometimes collide, as well as the focus on fashion and consumption, will prove very fruitful points for discussion. Do join us, if you can, for silent screen star Pickford’s first sound film.